6.74 points at 19 votes (rank 430). The Wagari Indians were at war with the palefaces for years. Now N.A.S.T. Railway, a railway company, wants to build a track through the holy valley of the Wagari Indians. Only Marshall McGraw, who is highly esteemed with the Wagari and the only White that ever entered their camp and left it alive, can avoid a new war. Through his special position he is the only one, that can bargain a peace treaty with the president in Washington. To prove to the Indians that he is worthy for this task, he has to pass a test which is very honourable and appropriate to the meaningful circumstances: he has to shoot as many ducks from the sky as possible! For a certain number of ducks he receives an item of piece (corresponds to a life). His mission is, to bring these items to the president. The bosses of N.A.S.T. have heard of this courageous mission and hired a troup of snipers to wait for McGraw in the town to kill him. But exactly through this town leads the Marshall's path to be able get the train that brings him to Washington! 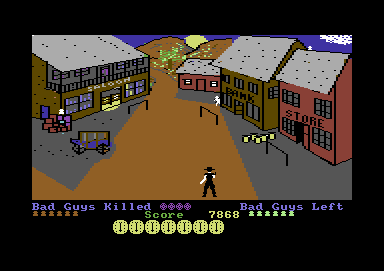 The game consists of four more or less different games that trace Marshall McGraw's ordeal. First ducks have to be shot to earn lives (game 1). 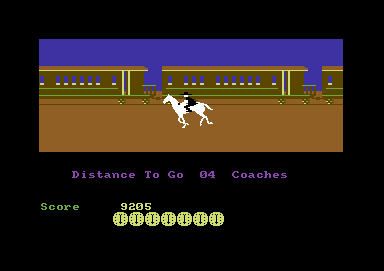 Then he has to reach the town by horse within a certain time limit (game 2) to then fight the snipers (game 3). This of course holds him up and the train has already left and has to be caught up by horse (game 4). The game is nicely coloured and nevertheless clearly-arranged at any time. Very detailled with nice ideas as e.g. the sunset during the shootout. Also, there are no digitalised noises and screams missing, more than sufficient for a "cheap game". The animation phases of the Marshall are ripped rather shamelessly from Impossible Mission and the horse including its rider are "taken on" 1:1 (incl. the riders tailcoat!) from Harvey Smith Showjumper, but in this case one has to say: better steal it well from somebody else, than do it yourself with a bad result. Concerning the music, the game opens as it is proper with an overture, the Wilhelm Tell overture by Rossini. During the duck shooting you hear atmospheric Indian drums from the village, only interrupted by the death screams that are rather unusual for ducks. During the riding, the overture of the start screen is recycled. There are no background noises during the showdown, only the shots and the digitalised death screams of the enemies - and sometimes of the Marshall, that are a bit deeper and more theatralic - can be heard. In the train level you only hear train noises which are rather realistic. Here you earn the lives that you need for the next sections. In level 1 you get added one life in the shape of a peace item per three shot ducks. You need to calculate the flying path of the arrow when aiming. You have to note that the arrow will fly faster the steeper upwards it is shot, whatever the reason for this might be. You start with ten arrows. Realistically, you get an arrow back when you have hit a duck. Unrealistically, you get two arrows back, when you have shot two ducks with one shot. Because if the shot duck hits another one on its way down it will be dragged along and also counted as shot. If you have shot all arrows or 40 ducks have reached safely the other side, the next section starts. In the second level you need four ducks for a peace item, in the third five. On the way to Kane you need good timing. The Marshall is in a hurry, so he has no time to ride around the bushes and stones, instead he has to jump over them, although this might hurt sometimes. Single bushes should not be a problem, only when they come in groups, then timing is necessary. The complete distance can be covered with the highest speed. The obstacles come in two different sizes. In later levels the task does not differ from the first level. Having arrived in Kane, Marshall McGraw needs to fend off snipers. Fortunately, N.A.S.T. obviously had problems with the budget and had to cut back on the snipers' quality. The snipers are well hidden behind windows, doors, houses, on roofs and in waggons and appear from behind those every now and then. 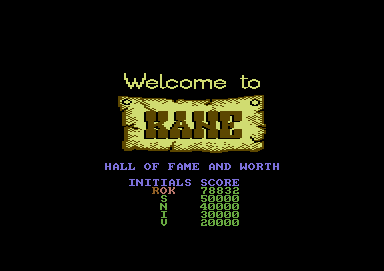 You move the crossline with the joystick up and down, if you move it left or right, Kane scrolls correspondingly into the desired direction. Moving around is the important thing here. You best do not spend that much time with shooting, but instead walk to your target, shoot and instantly go on again. You have to eliminate twelve snipers, a display at the lower part of the screen shows how many you have hit and how many you still have to get. There is also a display that shows how many shots McGraw still has in his colt. To reload you leave the screen to the right side. In later levels the task is not any different from the first level. Well, the train has already left. In this case it was the one to Washington. McGraw needs to hurry and catch it up, so that it wasn't all or nothing. This section practically is the same as the first riding test, however - notice the diversification - it runs into the opposite direction. At the lower border of the screen a display shows how many waggons you still have to overtake until you have reached the locomotive. In the first level you need to overtake 2 waggons, in level 2 seven and on level 3 eleven waggons. If you make it, you start again with 0 lives in the duck shooting section, but one level higher. The controls are more than simple. 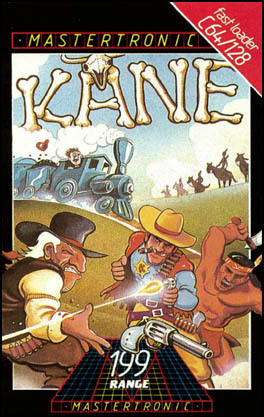 The joystick moves the Marshall or respectively his horse (games 2 + 4) or the crossline (game 1) or both together (game 3). You shoot with the fire button (games 1 + 3) or make the horse jump (games 2 + 4). The version by "Commo Bam" has the following cheatmode options: unlimited lives, unlimited time, unlimited arrows and unlimited ammunition. Rockford: "A fun and diversifed game, furthermore it is nice to look at. It is a bit unnerving that you have to learn the riding passages by heart to get anywhere. 7 points." 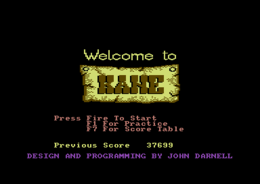 mombasajoe: "For a budget game, Kane is a title with beautifully high quality. But the overall picture is beclouded by the unnerving riding sequences and the fact, that except for the riding part there are only two resembling mini games (crossline vs. bow). Nice game for in between, but not more. 6 points." TheRyk: "Well, at Mastertronic you mostly got what you paid for, and that meant (with few exceptions), not very much, but half-baked games like this one. There are interesting approaches and some good ideas, but some implementations of those are just bad, e.g. it's annoying that you haven't got any chance of finishing the level after a fall, apart from starting all over again. In a generous mood, I can label it as 'reasonable' (4 points), but this is nothing one must know or even remember." Equinoxe: "Two totally flubbed riding passages and two cheap shooting sequences do not deserve more than 2 out of 10 points. Junk, even for a budget game."